AV Installs is a professional installation company with over 15 years industry experience. We offer both our private and commercial customers throughout the UK, a wide range of installation services, designed to meet their specific needs. Therefore, regardless of the make, model or size of your TV, we are confidence that we will be able to deliver the installation service you need. This is whilst continually maintaining the high level of professionalism and high standard of finish that we pride ourselves on. Our Flat Screen Installation Service is perfect for customers who have purchased a new TV or entertainment system and need support when it comes to setting it up. This includes unpacking the unit(s), setting up channels and smart features as well as connecting any other components to make up your full entertainment solution such as TV service providers, audio solutions or games consoles. Should you wish to mount your TV on a wall, then our TV Wall Mounting Installation Service could be just what you’re looking for. This solution is a great low-cost option for customers who would like to use an installation company to provide a safe, reliable and professional solution to meet your needs. 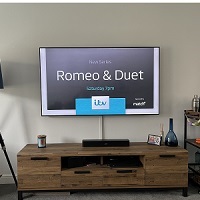 Suitable for all types of TV bracket and wall mountings, this service provides customers with a clean and professional finish, as it comes complete with a surface mounted cable management system to ensure any unsightly cables are cleanly hidden away. Still, not sure whether to wall mount your TV? Well, why not take a look at our blog post why should I wall mount my TV? to find out the 5 reasons why we think you should. You may not want a surface mounted solution though, which is where our Hidden Cabling services comes in. This service not only includes wall mounting your TV with the bracket of your choice, but it also comes with a complete hidden cabling service. This means that all interconnecting cables will be placed into walls, and hidden from sight. This service also includes any chase in repair work required as part of the installation. Larger installations can include many things such as multiple installations, ceiling mounted TV installation, TV mirror framing, TV lift furniture installations as well as any kind of motorised lift installation. What this service allows us to do, is plan and complete an installation which completely meets your needs. No matter your requirements, we will work with you to make sure it is delivered.